Hi Everyone. Well today is Day 2 and our prompt for the day is A Furry Friend so I thought I’d share a little bit of my past with you on this one. Also, for the first time ever, a picture of me. Hope you enjoy it! 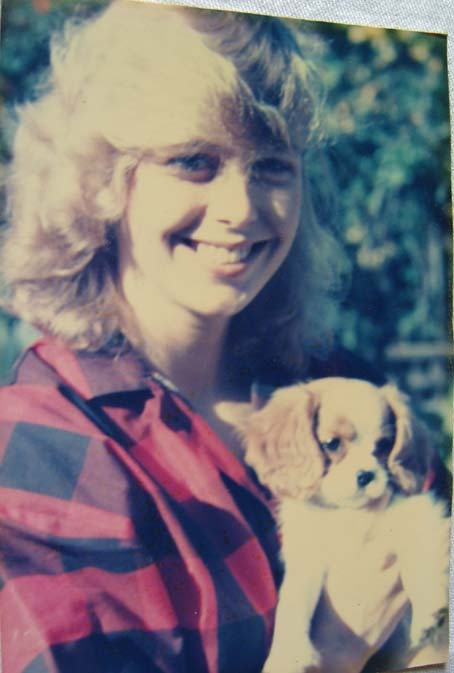 My first furry friend was a ‘toy’ Cavalier King Charles Spaniel; we called her Misty, I was fourteen when she arrived. She had such a cute, pretty face; I couldn’t walk down the street without people wanting to stroke her. I taught her to count. Every time she went to do her business in the garden, she was rewarded with a treat; one for a wee, two for a poo. After she came back in I’d ask her what she’d done and she would bark once or twice. She never cheated! She died aged seven and broke my heart. This entry was posted in #BlogFlash2012 and tagged #BlogFlash2012, Cavalier King Charles Spaniel, Furry Friend by Carlie M A Cullen. Bookmark the permalink. A lovely memory to share with us. We had a Cavalier too when I was growing up, they are wonderful friends. I could have written so much more but with the 100 word maximum limit . . .
Cavaliers are such fantastic pets, so gentle and real lap dogs. Misty died of something called Parvo-virus and not long after a vaccine was brought out for that very thing. But I had seven wonderful years with her and think of her often – she was my first ‘proper’ pet and holds a special place in my heart! I’m glad you enjoyed my memory. Hi Carlie. So sweet. You just want to hug her. Thanks for sharing and so nice to finally SEE you:) Reblogged this. Thanks so much. She was really sweet and had a fantastic temperament. Glad you liked it and thanks for re-blogging it. I love her ears. However, any animal with long floppy ears has my heart. 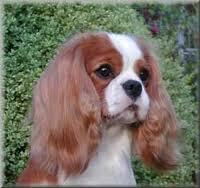 I know what you mean about long floppy ears, but for me it will always be Cavaliers that take 1st place in my heart. She was a beautiful dog. So sorry for your loss. I know how hard it is to lose someone we love. Thanks for sharing. Thank you – she was beautiful in every way. It is hard to lose your first pet – they always hold a special place in your heart, but it was many years ago now. I was 21 when I lost her and I now have a 25 year old daughter. Thank you for your very kind comments and for stopping by. Hope to see you here again. Oh Carlie, what lovely pictures, and what lovely memories! Thank you so very much for sharing! Yes they are lovely memories and I could have written so much more about what I taught her and some of the tricks she got up to as a puppy. I love dogs too, but Cavaliers will always be my absolute favourites. Peaches is an unusual name for a dog but with her sweet temperament, it sounds like it suited her.